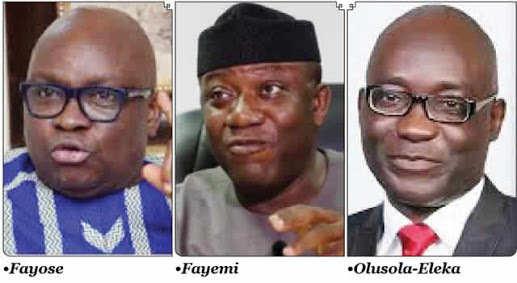 Many residents of Ekiti State have expressed deep concerns over the tension currently building up in the state following plans by the Federal Government to deploy about 30,000 security personnel for the Saturday’s governorship election. A cross-section of stakeholders, who spoke to The Punch, said the development was heightening tension and creating fears in the minds of the people. A commercial car operator in Ikere, Ajibola Idowu, described the idea of moving such large number of security agents to the state as ill-advised, arguing that it would automatically give an impression that there would be unavoidable clashes on Election Day. A trader in Akure, Mrs. Bisola Ilesanmi, said the security operatives would want to justify the essence of their deployment by creating tension. “Many of them can even decide to harass law abiding residents as a result of overzealousness just to impress their bosses that they are working,” she stated. A 70-year-old retired headmaster, Mr. Ade Ashaolu, who lives in Oye-Ekiti, told Punch that he would remain indoors with his family throughout the day of the election. He said, “My fear is that the politicians are too desperate to win this election and in such a situation, they would try to play smart. The heavily armed security personnel drafted to maintain peace may want to resist such illegality. The Mega Party Chairman in Ekiti, Dare Adekolu, however welcome the idea of deploying security personnel to the state. The state PDP Publicity Secretary, Jackson Adebayo, also noted that security remained a serious factor in any election, provided it would be to protect lives and property. The APC Publicity Secretary, Taiwo Olatunbosun, also sees nothing strange in deploying security personnel to forestall a breakdown of law and order, stressing that it would not be the first time such thing would happen. He said, “Under President Buhari, security personnel have been deployed and the opposition parties still won elections in some cases.